Despite the weather forecast being less-than-optimal (and a decent ride falling right before the start, always a participation killer) we had a total of 16 folks (myself included) show up on this ride! Good work, team! From Rivelo, we headed westward across the still-newish Tilikum Crossing over the Willamette River. From there we rambled south on the Willamette Greenway Trail. This was “state of the art” in the 1970’s but a bit outdated now. Still, they are doing work to improve it. And there are some great views and hidden nooks on this often bumpy, windy, and confusing path. We got back over to the east side via the new-new Sellwood Bridge. Two new bridges on one ride! 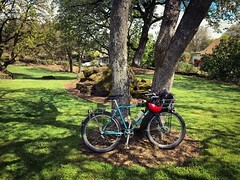 From there we rode the Springwater Corridor trail eastward to Lents. Here is where the rain started, and came down good. This was a bit of a slog, and at one point I heard someone call out that it was “beer-thirty”. I had a rocking round of trivia here to get rid of some stuff cluttering my parts bins, er, redistribute some good stuff back into the world! 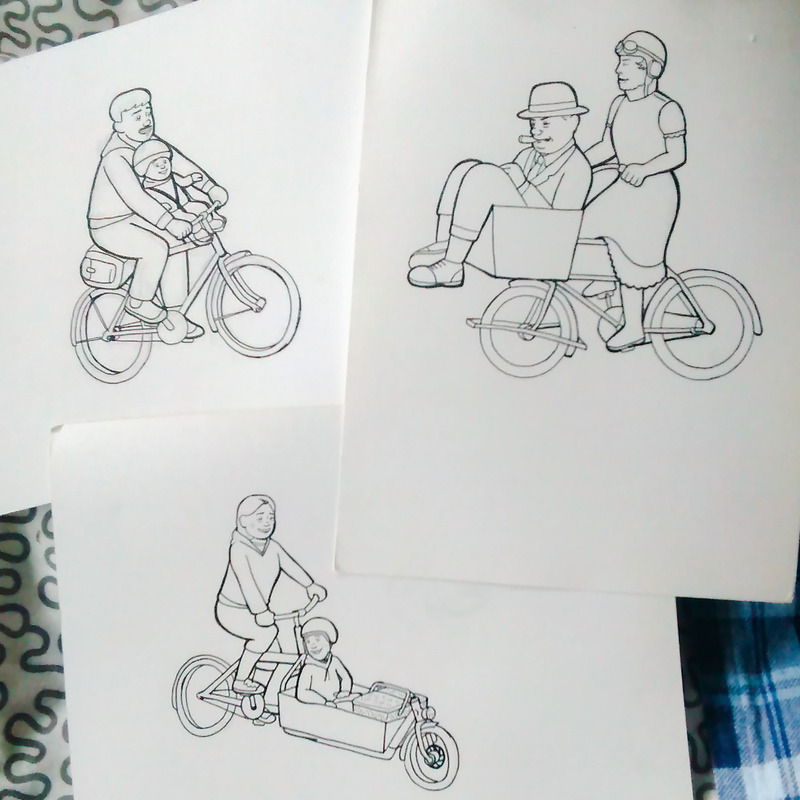 Honorable mentions: We had two Raleigh Twenties and the first Brompton in a while. 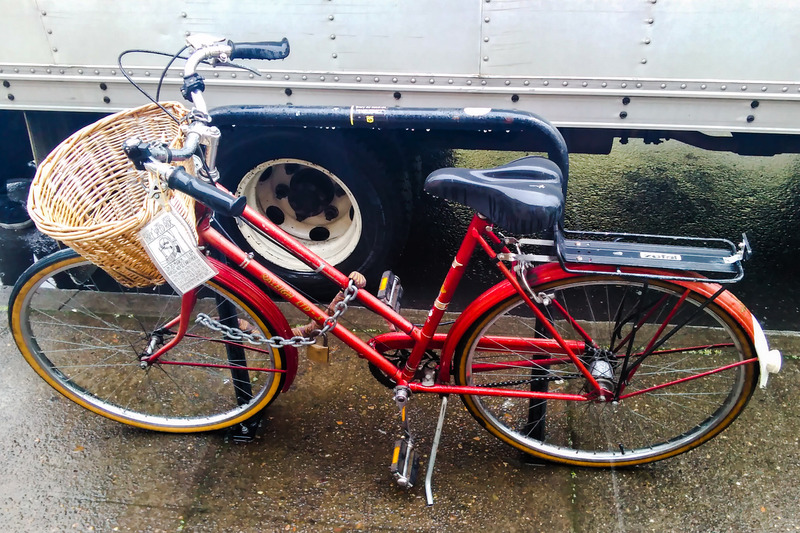 Also, Vince’s Mongoose MTB conversion is sweet (even if his saddlebag didn’t last the ride.) Special kudos to Dana Matechik, as this was her first ride since becoming a mom! Thank you to everyone who showed up! Hopefully next time we’ll have better weather. 😉 And special thanks to Rivelo for being the start point! 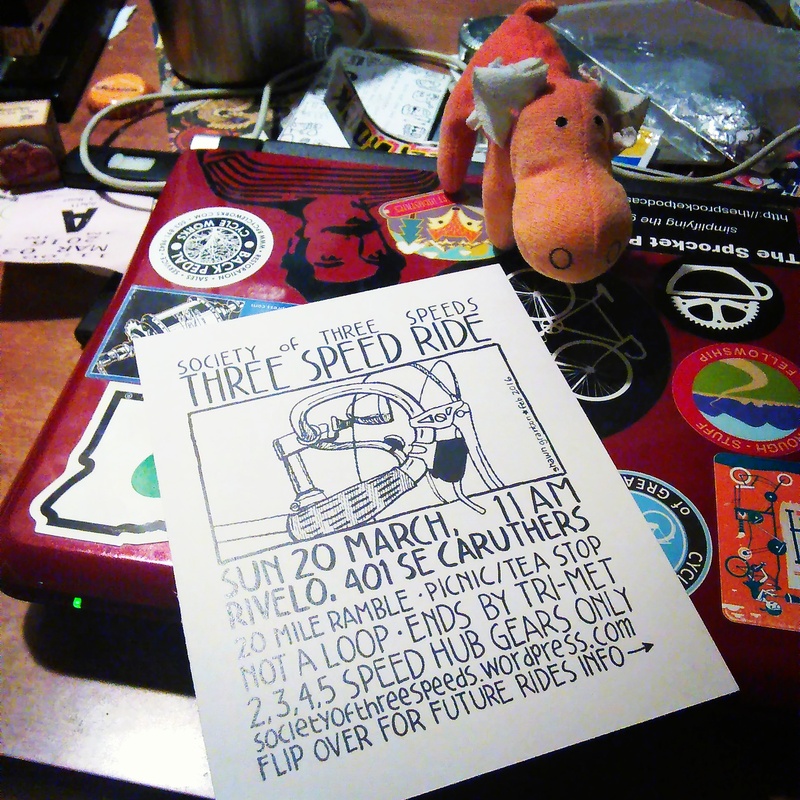 Three Speed Ride this Sunday! Hello friends and fiends. It’s just two short days until the first Three Speed Ride of 2016 occurs! Meet me Sunday morning, March 20th, at 11 am. We’ll be meeting at Rivelo, 401 SE Caruthers. This is just across from the rail museum, just east of the Tillikum Crossing, and a stone’s throw from the OMSI/SE Water MAX station on the Orange line. 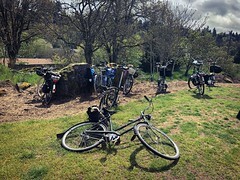 We’ll depart at 11:30 am and ride somewhere between 10 and 20 miles, end somewhere with food and adult beverage, and have a tea stop somewhere in between. Man, this weather right now is nice, huh? Well, unfortunately it doesn’t look like it’s going to last into Sunday. In fact, Sunday’s forecast doesn’t look so good. In fact, I’ve stopped looking at the forecast. In any case plan for rain and hope for not-rain. Initially I’m hoping for a 20 mile ride, but if it’s raining enough, I may truncate the route a bit. As stated above, we’ll be ending in an indoors spot for food and drink. I hope you can stick around, it will be fun! At the end, I’ll have a few prizes and giveaways. I may do it as a trivia contest, or just give stuff away based on want or need. We will see. We’ve sold out of all the memberships! Whew! It will still be a few months until the new membership packets are ready. I’ll have a handful of old buttons though, if anyone wants them. And this Three Speed Ride will make the debut of a new bike! 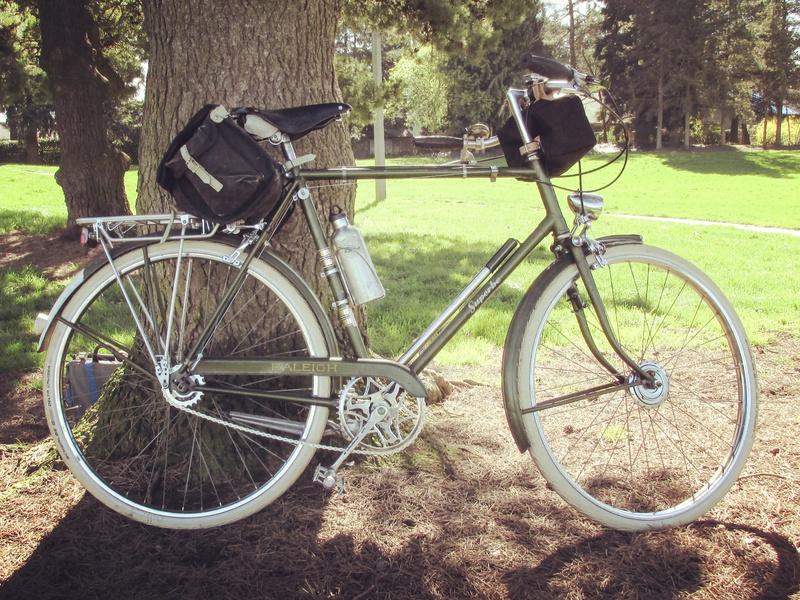 Friends, you may have noticed a lack of mention about m y three speed, the Raleigh Wayfarer. That’s because I haven’t ridden it in months. Currently it looks something like this. 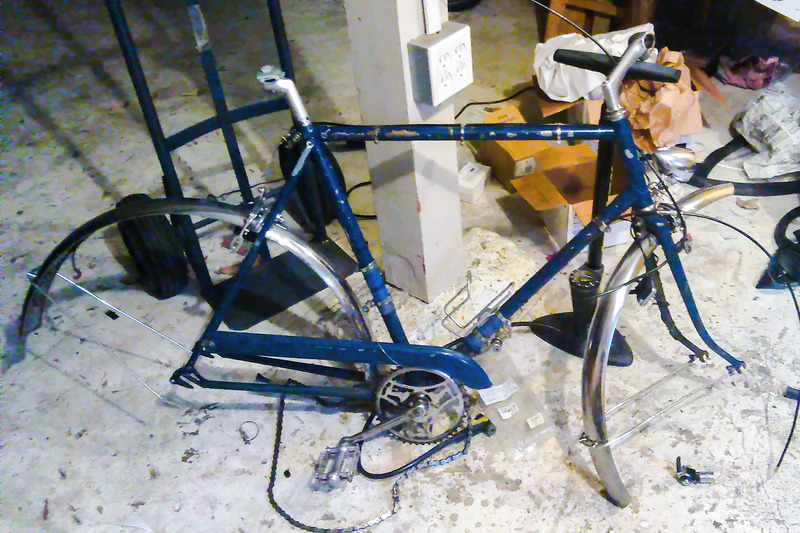 Yep, this stripped down frame is what remains of my Raleigh Wayfarer. No, nothing bad happened to it, no, I didn’t get into an accident. But it’s time to move on, and the Wayfarer is done. What “killed” it isn’t one big thing, but maybe a dozen smaller deaths. The biggest issue is the paint. Despite it being repainted twice, the paint is in bad shape, scraping and flaking off. I did briefly think about getting it stripped and powdercoated. Hell, I was thinking about getting some braze ons added before the powdercoating, because why not? Heck, maybe canti bosses. Then I realized how much effort and money that would be, all for a humble three speed frame. It would make it something it wasn’t, it would take it even further from the core British three speed that it started as. Now there’s nothing wrong with doing all these things if you really want to, but I didn’t want another major project like that, especially after getting a custom bike last year. Especially since there are plenty of good three speed candidates already out there. So the bike has been stripped, the good stuff saved for other things or for sale. And while I realize that a bike is an object, I do have some small twinges of guilt about its fate. I’ve had that bike for over five years, the longest run of my current bikes. I had some great fun with it. It did two Lake Pepin tours! It was the bike that kindled my love for three speeds, without it, there would be no Society of Three Speeds. But I have to be pragmatic here. Now it’s time for what comes next. 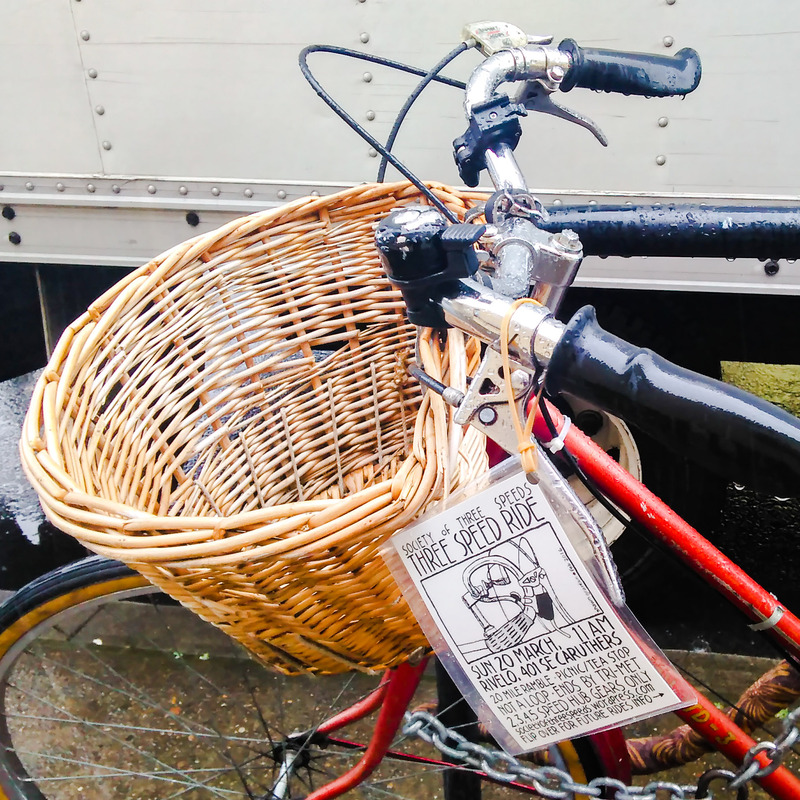 G & O Family Cyclery needs our help! Getting the word out, old school. moosemoose would love it if you came on the Three Speed Ride on Sunday March 20th! You know we here at Society of Three Speeds are old fashioned. If we weren’t, would we like three speed hubs so much? Anyways, one of the old fashioned things we like to do is get the word out about upcoming events by paper means. We print up a bunch of post cards and send them out to local members and other people on our Postcard Club list. (Not on the Postcard Club list, but would like to be? Go here to get on it!) But sometimes we run across a nice three speed on the street, and we like letting them know about the ride as well! That’s where the magic of laminators come into play! We laminate a few of those postcards, then punch a hole in the corner. Through that hole we feed a rubber band and tie it, so we can strap it to someone’s handlebars! Here’s a nice Raleigh LTD-3 that got tagged. And here was a Schwinn Collegiate that got the SoTS treatment! 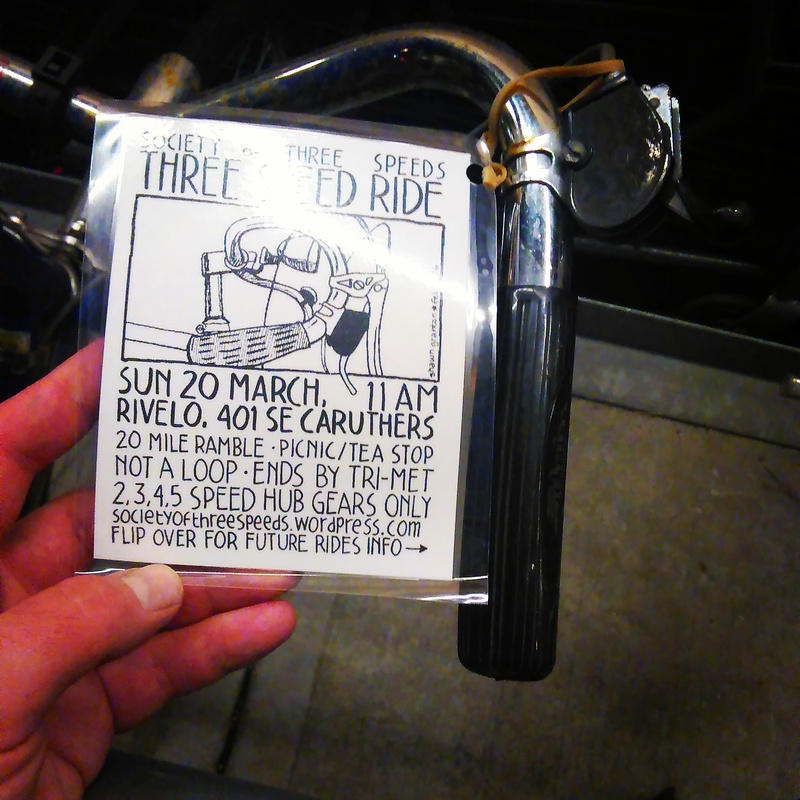 So if you’ve got a three speed parked around Portland, don’t be surprised to find a flyer strapped to your handlebars! And even if you didn’t get a flyer, come to our ride on Sunday March 20th! Pepin: Third time’s the charm? I don’t think I’ve mentioned this yet, but yep, I am going back out to Minnesota (and Wisconsin!) 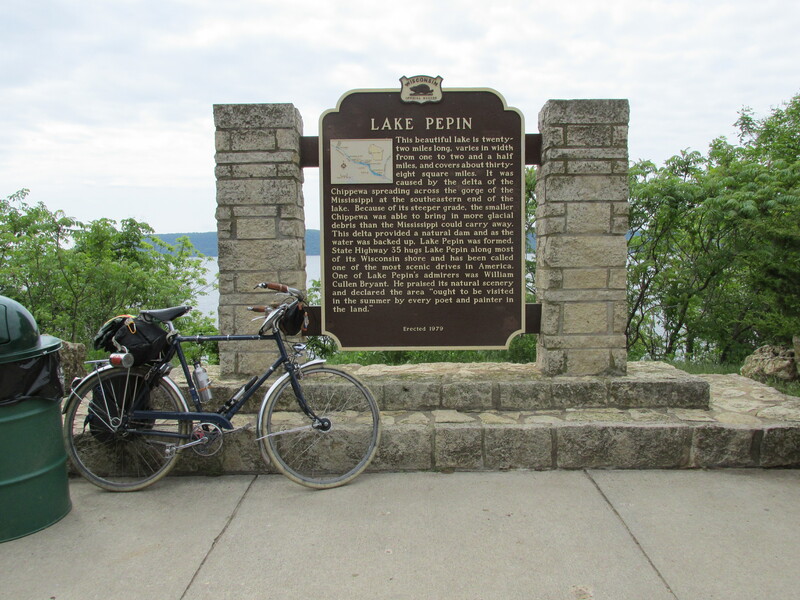 to participate in the annual Lake Pepin Three Speed Tour on May 14 and 15. Lake Pepin is America’s largest three speed typed event! This will mark my third year participating! After doing it last year, I didn’t know if I would participate in 2016. Since I don’t live in the Twin Cities, going to Pepin presents some logistical hurdles (and usage of vacation time.) But as 2015 closed, I realized that I did want to go in 2016. It’s just too much fun, and anyways, it’s good to do some vacationing in May since due to my job it’s hard to take extensive time off in the summer months. After doing the ride two years in a row, I definitely know what to expect out of it, so it’s not a totally new experience. And that’s cool. 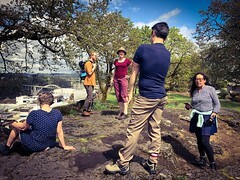 But I’m sure I’ll try to change up some things this year (like I WON’T try to go up to Maiden Rock), but I won’t know what that will be until it happens! Like every time I’ve been to Pepin, I’ll be taking the train (Amtrak’s Empire Builder) to and from, this time getting off and on at St. Paul Union Depot.) But unlike the last two times (or any time I’ve EVER taken the train), I’ll be riding sleeper! That’s right, on the way to St. Paul, I’ve booked a sleeping car! The big reason I’ll be pursuing this luxury is because I cashed in some gift certificates. My friends gave me a bunch of them for my 40th birthday (thanks, guys!) and I figured now would be as good of a time as ever to experience first class train service. I’ll still be taking coach home, but hey, getting a sleeper one-way is better than nothing! I’ll be spending a few days in Minneapolis, as per tradition. Though because of scheduling, I’ll be staying in Mpls on both ends of my Pepin adventure. And I’m pursuing the idea of biking from Minneapolis to Red Wing, the start/end of the Lake Pepin tour. I could do it in a day if I really wanted to, but I’d probably break it into two days and camp half-way. It’ll let me explore some different areas out there, and get in some camping to boot. I may also camp in Wabasha, the overnight destination on the tour. There’s a bunch of other folks that camp, so it might have a fun festival atmosphere. Plus, camping would be free!